Anaheim Fullerton Towing offers exceptional towing services for all of Southern California, including Orange County, Los Angeles, Long Beach, Riverside, and surrounding areas. For over 60 years, we have been trusted by countless commercial companies, city agencies, trucking companies, and municipalities for our safe, efficient, and responsive towing services. 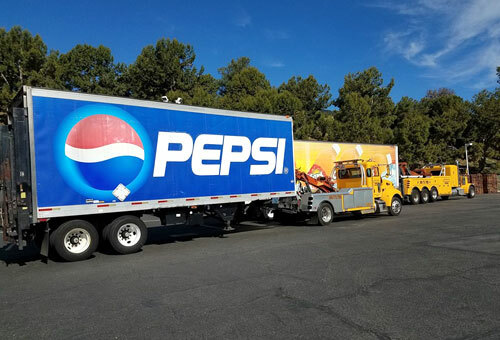 Whether you need us to tow a big rig from Barstow to Long Beach, transport a crane across state lines from Los Angeles to Las Vegas, or provide roadside towing services for a disabled bus in Fullerton, we have the expertise, specialized equipment, and hands-on experience to provide outstanding service every time. We hold contracts with the City of Anaheim, the City of Placentia, the Orange County Transportation Authority, California Highway patrol, local theme parks, and numerous local and interstate trucking company fleets. We can also perform cargo shifts and load shifts for trucks and semi-trucks that need to shift weight to legally pass through weigh stations and road scales. Even if you are stranded out of state, AF Towing can send a tow truck out to assist you any time of the day or night, and get you and your vehicle back on the road quickly and cost effectively. With our extensive fleet of tow trucks and heavy-duty wreckers, AF Towing can handle everything from from the toughest jobs to even the most delicate situations with professional service. We make sure that behind the wheel of every truck and every piece of equipment is a highly trained operator who is as courteous as he is skillful. 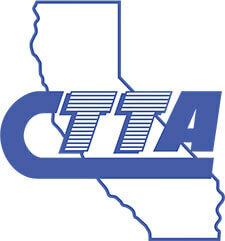 Each of our reliable tow truck drivers has an average of 8-25 years of experience, and are certified by the California Tow Truck Association (CTTA). They are not only well-versed in the industry’s best practices for safety and efficiency, but are experts at towing speciality vehicles such as cranes, big rigs, and buses. 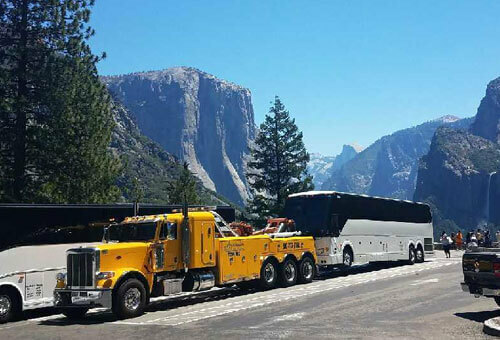 In fact, we often receive referrals from other towing companies who don’t have the equipment or expertise to handle bus towing, which requires specialized knowledge and skills for proper loading, transport, and unloading. Our fleet includes four 25-ton to 50-ton heavy duty wreckers, with rotators that are rigged especially for California’s unique and demanding transportation needs. 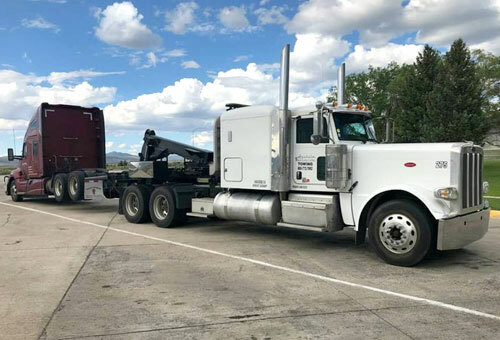 With one of our skilled operators behind the wheel, our wreckers are fully equipped to manage a wide variety of applications by utilizing the truck’s massive 60-ton lifting capacity and ability to rotate the load. Both the operator and the truck ensure your equipment is taken care of as safely and quickly as possible. Give us a call today to speak to one of our friendly and knowledgeable operators. Our 24-hour dispatch center is open to take calls around the clock. Or give us a call to inquire about setting up a commercial account. No matter your towing needs, we always offer free consultations, advice, and estimates. Anaheim Fullerton Towing is fully licensed and insured. I use their services quite often. They are very professional, extremely reliable and a pleasure to deal with. I will highly recommend them. 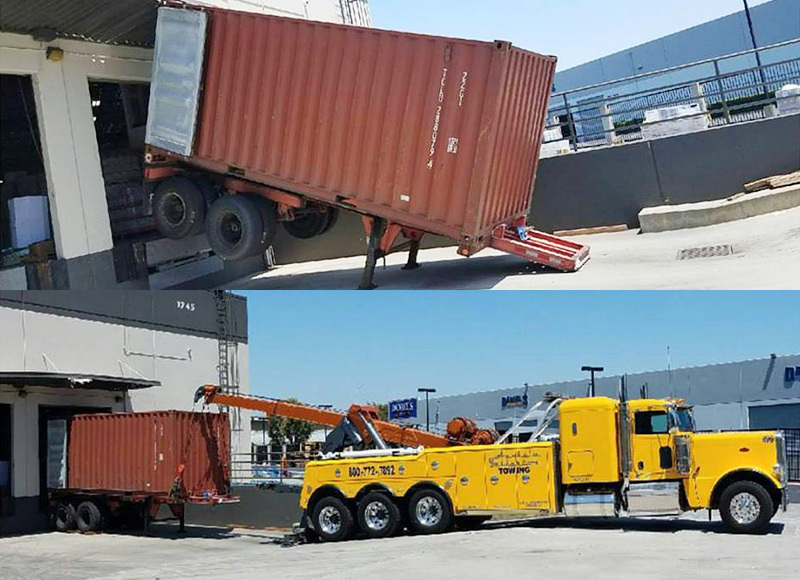 This photo shows one of our heavy-duty tow trucks in Fullerton lifting and towing a cargo container for a commercial client. 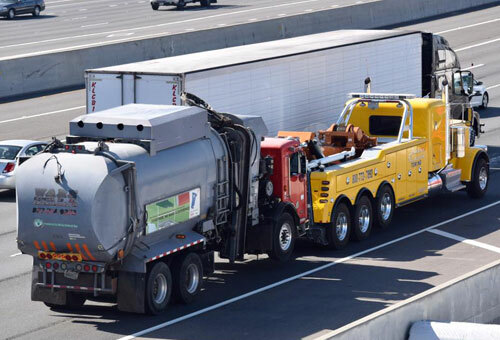 Our heavy duty tow trucks are outfitted with rotators that can lift and rotate loads up to 60 tons.